Erected in 1885, the Piano Bridge was named for the twanging sound that was made when crossing the bridge. 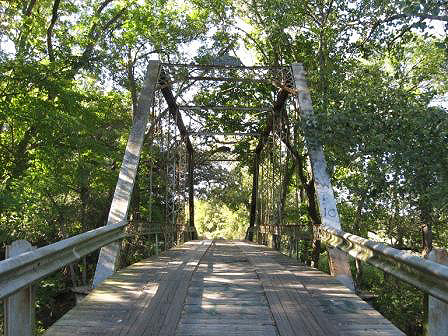 The bridge spans the Navidad River and connects the communities of High Hill and Dubina, Texas’ first Czech community. The connection established an economic and social value to the communities that affected the quality of daily life. Piano Bridge has seen the evolution of transportation from riding horseback to the horse-drawn carriage to Model T cars to modern vehicles. Recently, the planks of the bridge were nailed down, resulting in the twanging noise of the bridge to cease. Due to weathering and time, the bridge has slowly deteriorated and the future of the bridge is uncertain. Discussion of building a new bridge has been brought up, but local officials feel that by-passing Piano Bridge will lead to its further destruction. Local and state officials are determined to preserve the historical value and integrity of Piano Bridge.